For all 1/72 scale armor fans, DML has taken its 1/35 scale kit of the developmental Neubaufahrzeug tank and redone it in small scale. 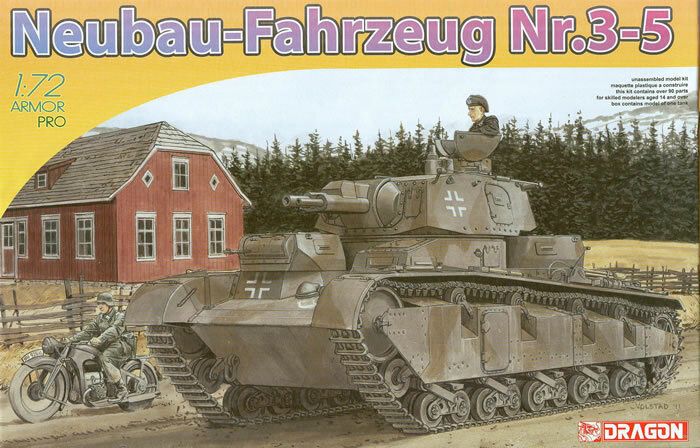 As with its larger brothers, the “Neubaufahrzeug” (new construction vehicle) – Nb Fz for short – vehicles used Rheinmetall developed hulls, first with a Rheinmetall rolled plate turret and then a faceted Krupp one. Prototype 1 had the former and Prototype 2 the latter design, and all three pre-production machines used the Krupp design. The Rh-B turret also mounted its unique twin gun arrangement (one 3.7 cm antitank gun and one 7.5 cm support howitzer) one above the other, whereas the Krupp turret placed them side by side (7.5 cm on the right). Initially the small turrets were planned to mount twin MG 13 7.92mm machine guns, but in reality only fitted single weapons. A third MG 13 was mounted in the mantlet of the main turret as well. While all of them were built between 1934-35 they were still under test in 1940 when it was decided to send the three O-series tanks to Norway. One was destroyed but the other two were later returned to Germany. This kit is a smaller version of the bigger kits but due to the smaller scale and excellent us of slide molding eliminates a large number of parts and all of the etched brass. The entire upper hull and sponsons are molded as a single piece with many of their details in place, and it is a spectacular piece of work. The lower hull is actually a single piece belly and two running strips for the suspension units; however, here all of the bogies comprise a single unit with only the lead bogie wheel separate. The two “wing” turrets consist of five pieces each with closed hatches. Only the commander’s hatch in the main turret is a separate part. It comes as a three-piece “dustbin” cupola but if you wish the hatches opened you have to split them yourself. As these were the “combat” versions of the tank, the directions provide for five different options that cover the three armored versions. Two are in grey and brown camouflage as with Pz.Abt.z.b.V. 40 in Norway and three are for them in Germany in 1940 with turret numbers 8, 9 or 10. A sheet of Cartograf decals with dedication markings for vehicle 10 is also included. Overall 72ers are going to be pleased with this kit and as it is simplified but with nearly all of the details of its larger brother captured should be popular.